The reasoning was simple. The project brief involved making a series of 500mm siesmic cuts into the staircases of a 13-story Auckland office building to make it earthquake proof. So to make sure the work was completed effectively and efficiently over a 3-week period we just went out and purchased the best possible machine for the job, a new Husqvarna WS 482HF high-frequency wall saw! We could have done the job with one of our existing 20 odd Husqvarna saws but this one just had more power and more grunt. We swear by Husqvarna so there was never any doubt that this would be our brand of choice. On top of that Yougnman Richardson & Co Ltd always back their products 100% so we felt confident that they would be quick to sort6 any problems should they arise! 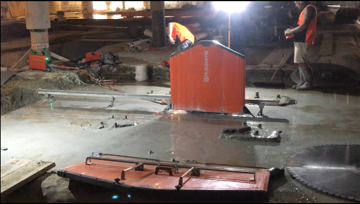 This is a very powerful machine when it comes to cutting reinforced concrete, brick and other building materials up to 730mm thick and can be used for all kinds of opening including stair, bevel and flush cutting. Requiring only a two-person operation it’s light and easy to assemble and disassemble. Hight efficient electric motor retains high power to the spindle over a wide rpm range. The 19kW max spindle output has variable rpm control which allows you to find the ideal speed for each blade dimension from 600 to 1600mm, blades. And finally, the remote has a logical design with a large and clear display that shows the current performance of the saw. With the wireless remote control, it’s easy to change the blade rotation to get the water spray in the right direction. Wall Sawing is a saw that is used to cut precise dimensions. 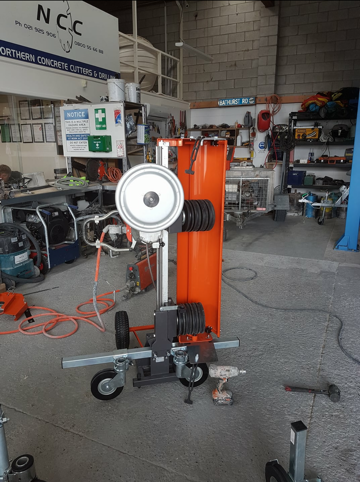 The wall saw is powered by hydraulic power pack for concrete walls, wall sawing provides the quickest and cleanest method.